A continuous stirred-tank reactor (CSTR) with heat exchange is used for an exothermic reaction. Multiple steady-state solutions are observed; they can be stable, unstable, or exhibit sustained oscillations (limit cycles). The steady-state operating conditions depend on initial conditions (CSTR start up) and on the residence time, and limit-cycle behavior is observed for residence times greater than about 30 minutes. 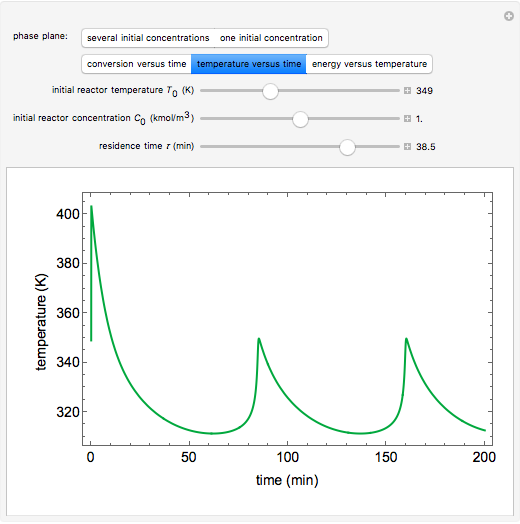 Select "phase plane 1" to plot reactant concentration versus reactor temperature for five initial concentrations; change the initial reactor temperature with a slider. 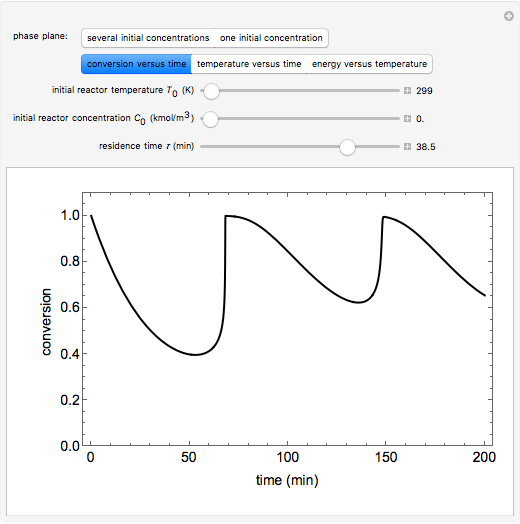 Select "phase plane 2" to plot conversion versus temperature for one initial condition; set the initial reactor temperature and initial reactant concentration with sliders. The reactant feed concentration is 2 and the feed temperature is 298 K. In both plots, the arrows indicate the direction of time. 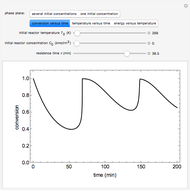 Set the initial conditions with sliders for "phase plane 2", "temperature vs. time" and "conversion vs. time" plots; these show how a steady state (or a limit cycle) is approached. 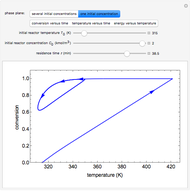 Select "energy vs. temperature" to plot heat generated and heat removed versus temperature; the intersections of the straight blue line and green curve correspond to steady-state solutions to the mass and energy balances for the CSTR. 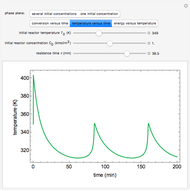 The heat transfer fluid is at a constant temperature of 300 K.
where is the concentration of reactant ( ), is the feed concentration of ( ), is time (min), is residence time (min), is the rate constant (1/min), is the rate constant at mean temperature (1/min), is reactor temperature (K), and is activation energy (kJ/kmol). where and are the heat transfer fluid and feed temperatures (K), is the overall heat transfer coefficient times heat transfer area (kJ/[min K]), is reactor volume ( ), is specific heat capacity ( ), is density of reactants ( ), is average heat capacity of reactants (kJ/[kg K]), and is heat of reaction (kJ/kmol). where and are in units of ( ). J. G. Ekerdt and J. B. Rawlings, Chemical Reactor Analysis and Design Fundamentals, Madison, WI: Nob Hill Publishing, 2002 pp. 296–316. 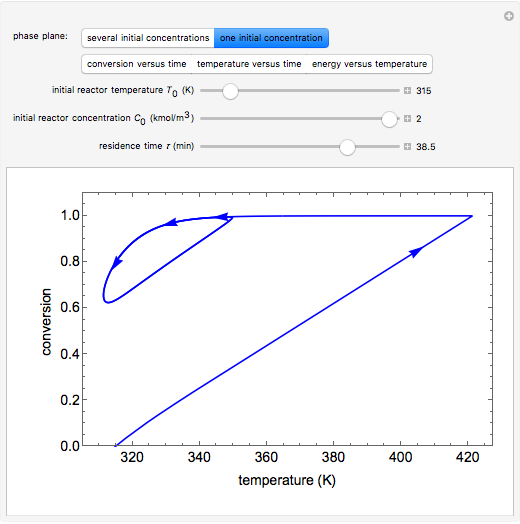 Multiple Steady States in a Continuous Stirred-Tank Reactor with Heat Exchange. www.colorado.edu/learncheme/kinetics/MultipleSteadyStatesCSTR.html. Rachael L. Baumann "Multiple Steady States in a Continuous Stirred-Tank Reactor with Heat Exchange"